Kevin Acquires Enough Woe to Write a Country Song | ardently aimless. 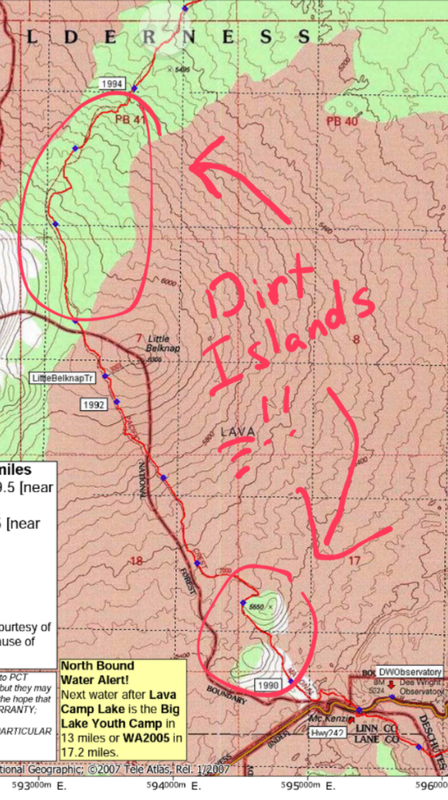 I woke on my little dirt island in the middle of the lava field I’d stupidly decided to cross in the dark. Dirt Island in the lava field. Just a little stroll through a LAVA FIELD!!! Washington giving me the stink eye. 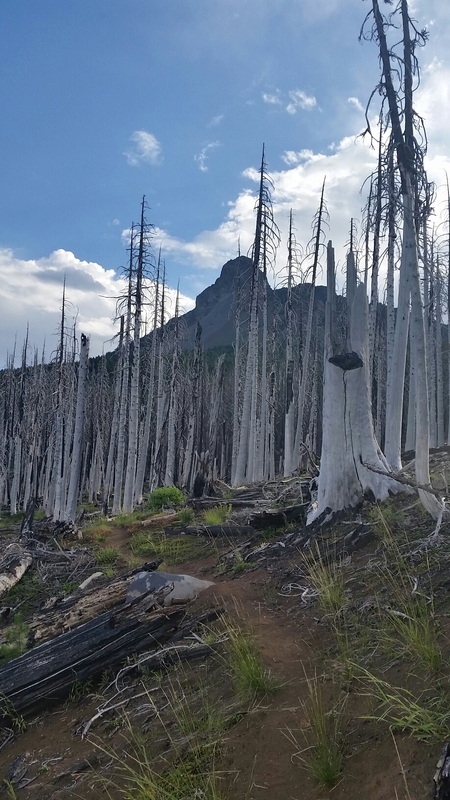 plus just the dramatic scenery of the burn area I was walking through was enough to distract me and trip me up a few times. But the path became more hospitable again and I quickly found myself at the side trail for BLYC. I got down there to discover the place deserted, save 3 hikers who were taking advantage of a rare cell signal and rummaging through the hiker boxes. It was eerie. And obviously I wouldn’t be getting the veggie feast I’d been hoping for. So I grabbed some peanut butter and a load of bread from the hiker box, popped myself down on a couch, elevated my leg, and stuffed myself on peanut butter sandwiches. I had found where they had our resupply boxes (which l retrieved myself from the closet, total honor system here), and I got to work sorting out and repacking all my food stores. Not having the prospect of a fresh meal, I decided to get in and out quickly, but storm clouds had rolled in quickly and opened up without warning. So, I relegated myself to spending a little more time there and killed an hour blogging and facebooking. Very productive. The rain stopped and I got ready to leave, but then it abruptly started up again harder than before. I wussed out and sat back down. Three and a half hours from when I arrived I finally said enough and put my poncho on and walked out into it. It stopped raining within 5 minutes, naturally. The terrain got steeper and the views more dramatic, and all day the threat of rain was held over me, but little more than drizzle materialized. I was feeling good, hoping to make 20 more miles, but not feeling rushed. I just mosied along snapping pics and chatting with day hikers. Black Butte? You tell me. 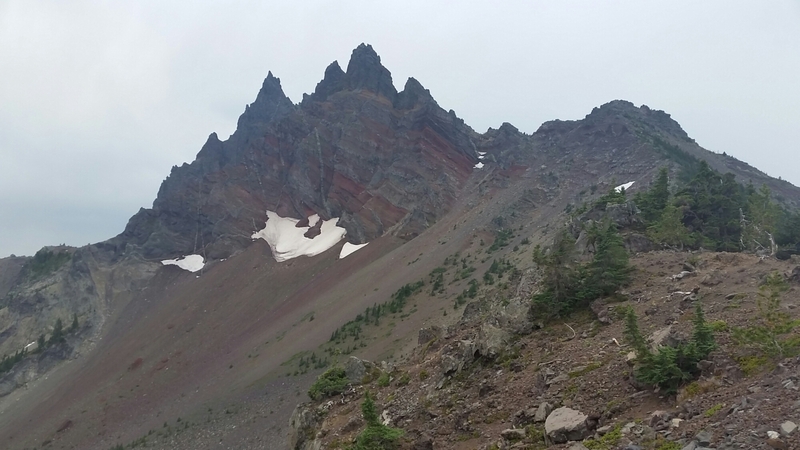 Three Fingered Jack. Poor fellow. 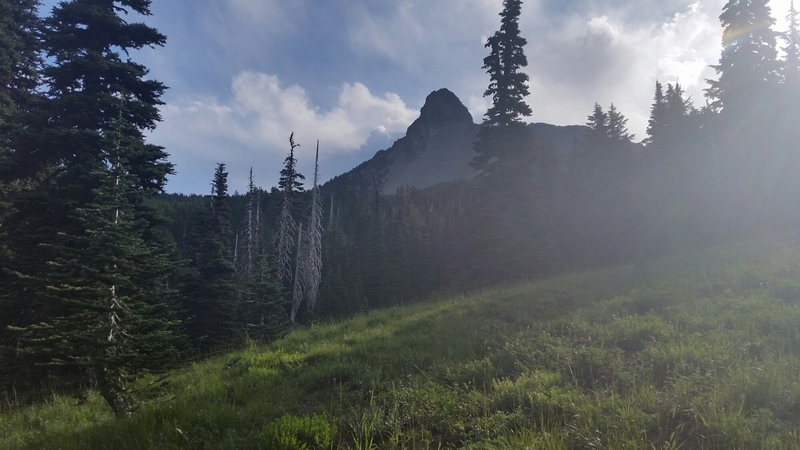 As I rounded a bend on the approach to Three Fingered Jack, I suddenly felt my shoe loosen. I looked down to see the lace had broken. 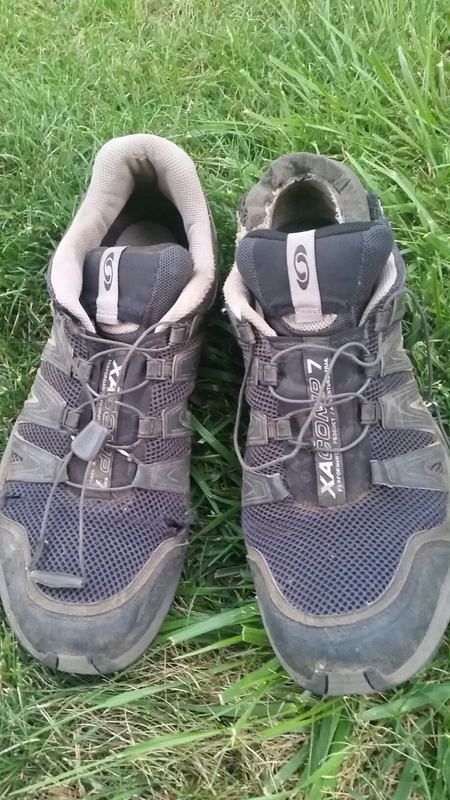 This wouldn’t have been much of a problem except Salomon uses a cinch-tie mechanism on an extremely thin lace, so I had to pull the lace all the way out, remove the tightening mechanism and pull tab and carefully thread the broken lace back through tiny eyelets. I had to skip the bottom two lace loops because the fact that I would be tying them in bows meant that I’d have to use more material than the cinching set-up required. After ten minutes of tinkering I resumed my walk, plodding along with a very loose feeling shoe. I hit my mark of 20 miles and landed at Rockpile Lake as the sun was setting. There were already a number of tents there, and I heard snoring coming from a few. It was 9:00 by then, hiker midnight, so I set up and ate as quietly as possible and went to sleep to the sounds of deer roaming just outside my tent. Having come just shy of 30 the day before I was eager to make miles. Straight out of camp I adopted a quick pace, but in about 12 miles I ran into a series of creeks that I had to hop across, slightly aggravating my splints due to having to walk on tippy-toes across rocks. So I slowed it down a touch so as not to worsen my already degrading condition. But it was too late, and I slowed even more due to pain. However, I ran into a southbound section hiker who, after chatting a bit, offered me some big 600 mg ibuprofen. 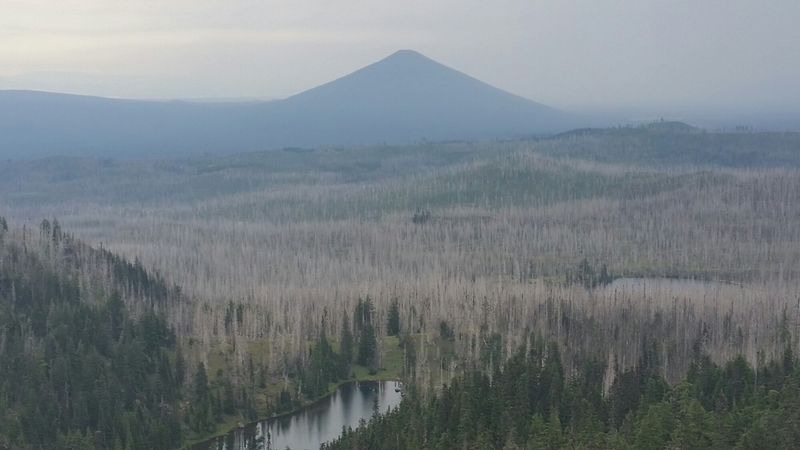 I gladly accepted and shuffled along with Mt Jefferson as my Northstar. But I had lost a lot of time with my slowed pace, so when it came time for lunch I just decided to eat and walk. My food had been hydrating for a couple hours so it was ready to go. I grabbed my spoon, unscrewed the lid of my food container and plunged my spoon in. Before I got a chance to take a bite I tripped on a tree root, went down on one knee hard, and smashed my food cup on the ground with my untouched meal. Today was shaping up to be my shittiest day on trail. I picked up the pieces of plastic, covered in food goo, wiped said goo off of my leg and pack, and grabbed a chocolate bar from my bag as a substitute lunch (it would take at least another hour to soak another meal). This particular chocolate bar was branded Chocolove for the love poems it had printed inside the wrapper. As I nibbled the last square I unfolded the wrapper all the way to see what profound message of love was scribbled therein, and giggled a little to myself at the absurdity of it. Just as I was doing so I came upon a trio of girls sitting with their packs off. We exchanged the requisite “How’s it going?”s, and I explained my giggle with the presence of love poetry in my chocolate bar, which elicited a request of a reading from my new acquaintances. So I obliged. As I read the poem as seductively as possible whilst struggling to maintain a straight face, the girls erupted into a contagious laughter and I struggled to get the words out. After all the laughing subsided, we did introductions: they were Foggy Goggles, Soul Craft and Lickety-Split. I told them that the laugh was much needed and couldn’t have come at a better time. They of course asked me about my woes, and sounds of sympathy came from each of their mouths after listening to my litany of grievances. Goggles offered me some pain medicine, and again, I accepted. After hiking together a short while I was feeling great and decided to turn up the speed. I said goodbye and thanked them again before charging up the mountainside on my approach to Mount Jefferson. I popped my headphones in and felt no pain as I wandered up and over a crest and found myself in Jefferson Park. 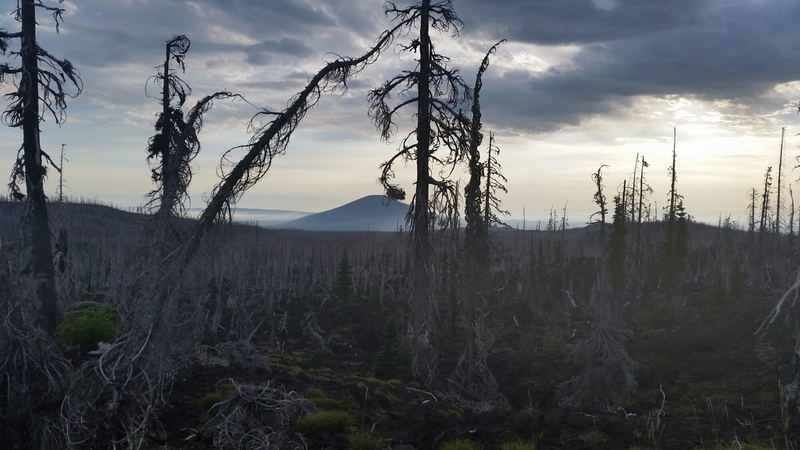 I hadn’t looked at a map for days or heard anything about the trail ahead, so when I came upon this flat, beautiful alpine meadow under the nose of Mt Jefferson I was stunned. I slowed my pace and soaked it all in, forgetting in my awe to take pictures. Eventually the trail began to climb again, up into a cloud, and glacial pools of an unbelievable blue peeked out from the mist. 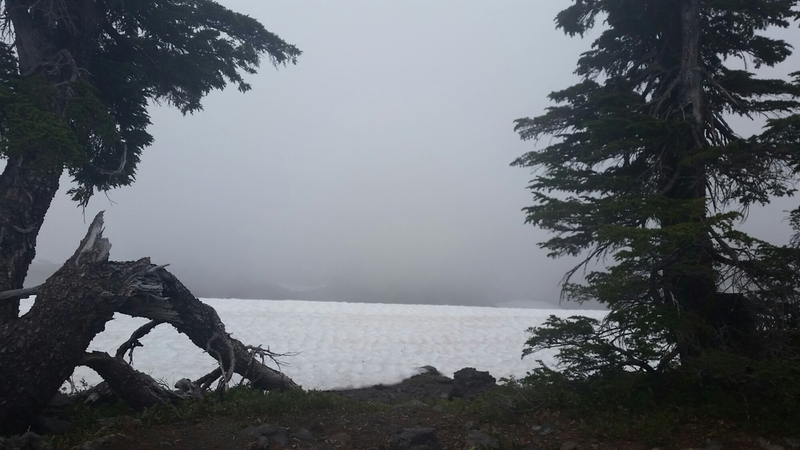 Soon, I was up on a ridge, buried in a cloud, with about 30 ft of visibility, and realized the trail veered off into a snowfield on the other side. I hesitated for a minute. It was approaching 5:00, and not knowing how long I’d be at this elevation could prove dangerous. But after checking elevation charts I was reassured by the steep descent I had immediately ahead. A few steps in to the snowfield had me sliding in all directions and, even though I couldn’t feel it, I knew this couldn’t be good for the leg. So instead of fighting to stay on path, I spotted a cairn off to my right, pointed my toes in that direction and skied down the hill in my shoes, steadying myself with my trekking poles. My day was turning out all right. I came down the mountain quickly, which I’m sure wreaked havoc on my shin splints, but I felt almost nothing for hours. It wasn’t until my approach to Olallie Lake Resort that the drugs started wearing off, but I was close to more painkillers. For this reason, plus candy, I thought I’d go check it out. Besides, storm clouds were gathering and I wanted to sit and assess my game plan. Once there I bought myself some Advil, a Snickers bar, a bag of Sun Chips, and grabbed a fistful of Red Vines from the hiker box. This was supplemented by a wonderful donation of fresh fruit and some Ghirardelli chocolate from the woman working the shop. 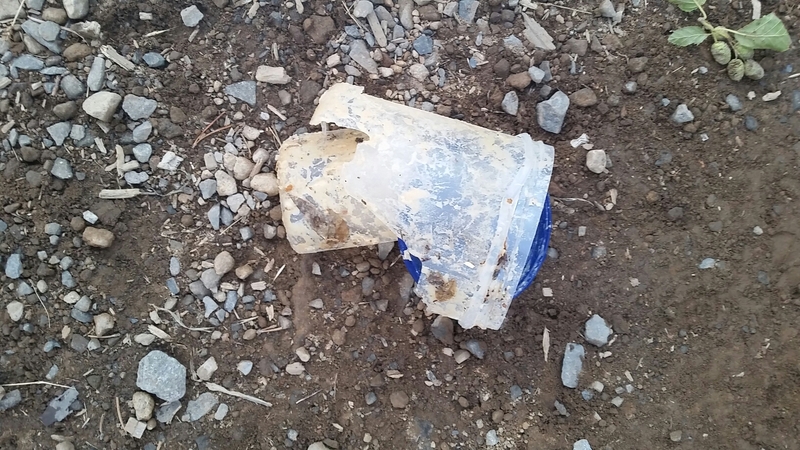 In addition, she let me take an empty beef jerky container that, while ridiculously large at twice the size, could replace my broken food cup. Outside, I sat on a bench on the front porch and looked at the Halfmile app to see what my camping and water options were. There was camping not half a mile away back near the trail head, and the woman at the shop said I could fill my water off the spigot on the side of the building. Even though this was only 32 miles for the day I was not looking forward to walking in the dark and the rain, so I got my stuff ready to move on that campsite. Just as I put my pack on a hole opened in the clouds just above me and let blue skies and sunshine through for the first time all day. It was only 7:50, and this opening sucked away all my excuses not to walk a couple more miles. With a sigh, I checked my maps again and picked Jude Lake as my target. At only 4 miles, I could still get there by nightfall. And sure enough, I didn’t put my headlamp on until about 2 minutes before arriving to a camp site alongside the lake. Everything was soaked when I got up. I fought my way through dew soaked tree branches and underbrush to the lakeside to fill up my water bottles. It was warm. I packed up my tent, soaking wet, with my rain fly hanging off the top with the hopes that it would dry somewhat while I walked. “Today was going to be a better day.” I promised myself. I ran into a couple of thru-hikers and chatted briefly, but I was feeling good and wanted to make good time while I was so I hustled on. There was plenty of water running off the hillside in the form of springs, streams and creeks so I exchanged my warm lake water for icy cold spring water and walked on feeling much better. It’s the simple things, ya know? 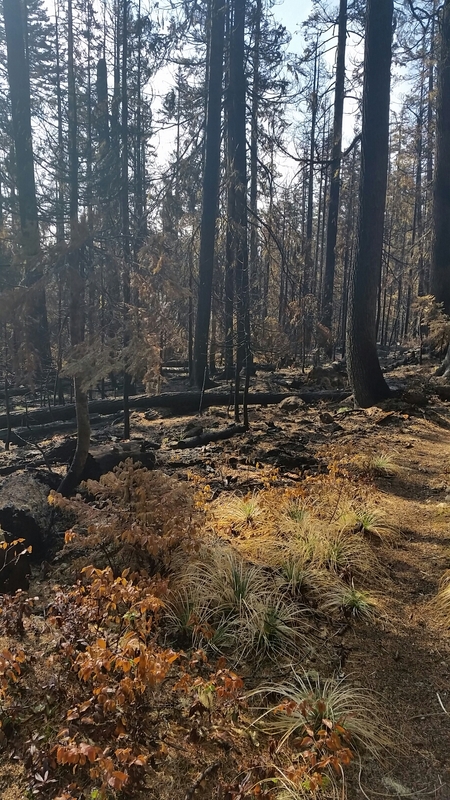 I passed through the burn area that had been closed up until a couple days prior and some logs were still smoldering. The colors of the freshly burned trees reminded me of autumn and the smell of bonfire permeated the air. Unfortunate as it was for the area, it was great for the senses. Around midday, I ran into a southbounder who informed me of some trail magic a few miles ahead in the form of rootbeer floats and donuts! Moving on, I had a new lightness in my step. I hadn’t had trail magic in weeks! I arrived there with Alan, an older gentleman thru-hiker I had chatted with briefly on the approach, and we both sat down and enjoyed the hospitality of Coppertone, a 2006 thru-hiker. He fixed us up a float, offered us donuts AND cookies AND BANANAS! Heaven. I spread my tent out to dry, ate my lunch, Coppertone’s offerings, and just relaxed for an hour. But the show must go on, so I thanked my host, threw my pack on, and hurried off with a smile on my face. I already had 26 logged for the day and it was 3:00, so I didn’t need to rush. The trail followed the shore of beautiful (if somewhat overpopulated) Timothy Lake and I kept stealing wistful glances at all the normal people enjoying themselves in the water. But the trail pulled away and started to climb again. 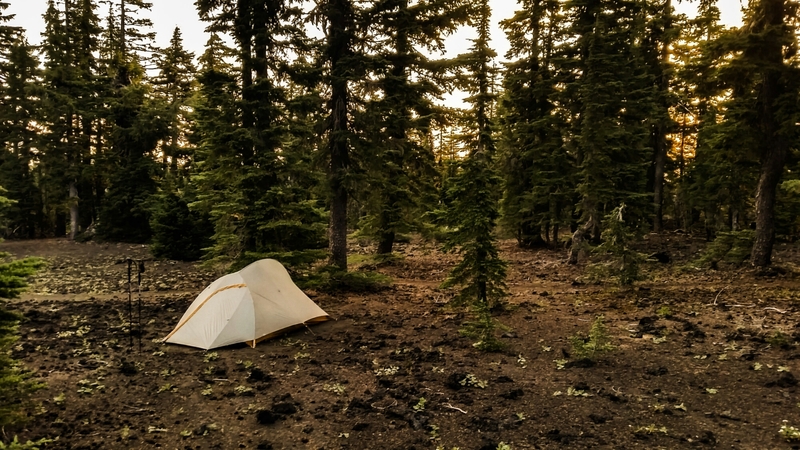 There was a spring not too far up ahead and I planned to fill up there and then hike on, “dry camping” a few miles out from Timberline Lodge so I could make an early strike on their breakfast buffet. When the rain started I held off on putting my poncho on. It frequently starts and stops in the Northwest, so I didn’t want to jump the gun every time it starts misting. When it really opened up, by the time I got it on I was already drenched. My feet felt like they weighed an extra pound apiece, and in order to not splash mud into my shoes I danced side to side on the edge of the trail to dodge the puddles forming. Soon though, my shin began to ache so I abandoned this and simply stomped through the PCT River. I reached the spring and found a large campsite with 3 tents and a tarp already set up for the night, and the temptation was high to stop and get out of the rain. But I still had a planned 10 miles, so I resisted and carried on, thinking about my friend Stubing’s policy regarding rain: he just keeps walking until it stops, then sets up camp. Trying to set up in the rain would only result in a very wet tent. Happy I was not. I had done 35 already, so I was just being stubborn. As I walked along a ledge flanked by pine trees I spotted a huge mountain peeking out through the rain and low clouds. It must be Hood, I thought, and reached for my phone to snap a picture. Waterproofness and the camera were the major reasons I selected my phone, but I soon came to realize that, though not damaged by water, it was rendered useless when the touch screen was wet. After struggling to get it unlocked I aimed the camera and attempted to shoot, but tapping the screen only made it zoom and it was impossible to undo it. Frustrated, I pocketed the phone and stormed off up the path once again. After I crossed the first of 2 highways in this 10 mile span, I decided I’d had enough and immediately began looking for a camp spot. But flat space that wasn’t a wash was no where to be seen, so I hiked on as the forest dimmed around me and the trail sides steepened. 2 more miles on I was starting to lose hope and contemplating walking all the way to Timberline, but I spotted a fairly level spot in the forest. I went over to survey, and after clearing some pine cones and branches and scraping away a layer of needles to level it out a tad I had myself a perfectly habitable campsite. Between the rain slowing and the trees offering some protection I was able to assemble my tent with minimal wetness inside. I slinked into my sleeping bag and heaved a sigh of relief; out of the cold and wet finally, and I had managed to get a decent day of 41 miles in! I fell asleep happy in that knowledge, dreaming now of the lunch buffet at Timberline.